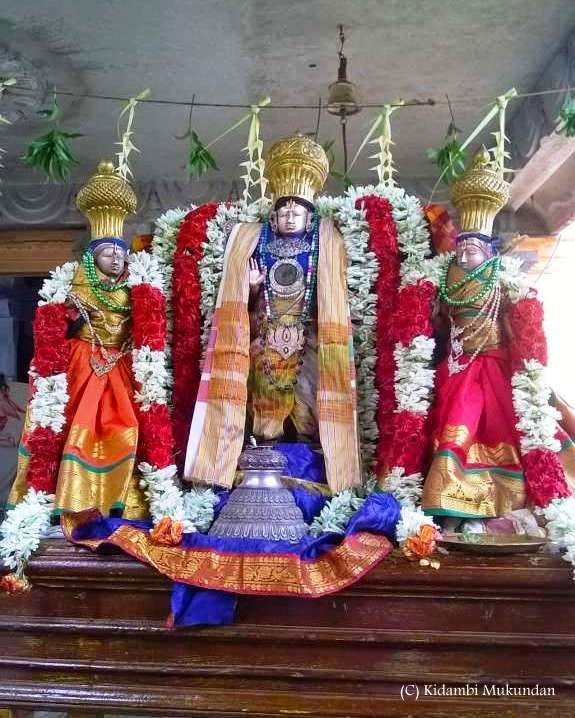 At Thiruvallikkeni divyadesam - the samprokshanam at Sri Parthasarathi Swami temple is now confirmed to be on Friday, 12th of June 2015. The Brahmothsavam of Lord DevapPerumal is now on and today is day 2 of the Uthsavam. 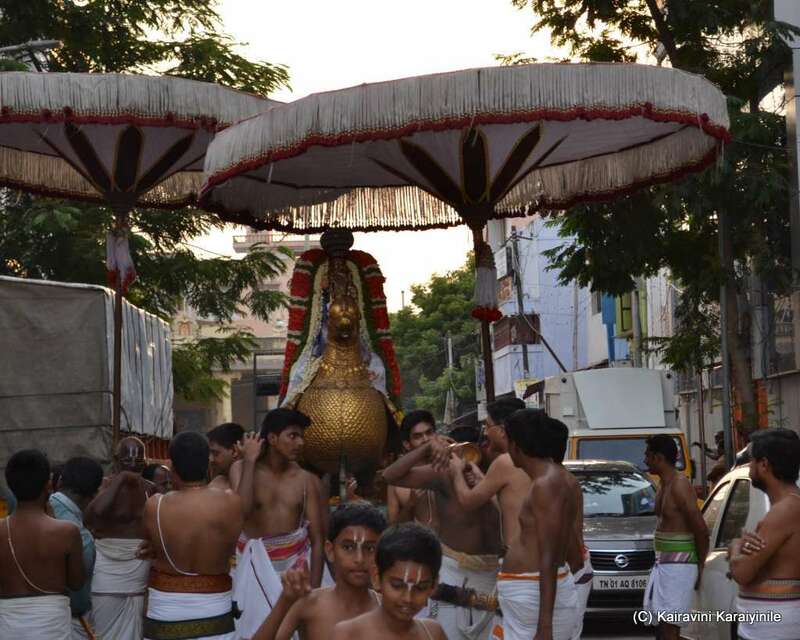 It was to be Yali Vahanam – but Perumal had purappadu in kedayam. Here are some photos taken during today’s purappadu at Thiruvallikkeni. 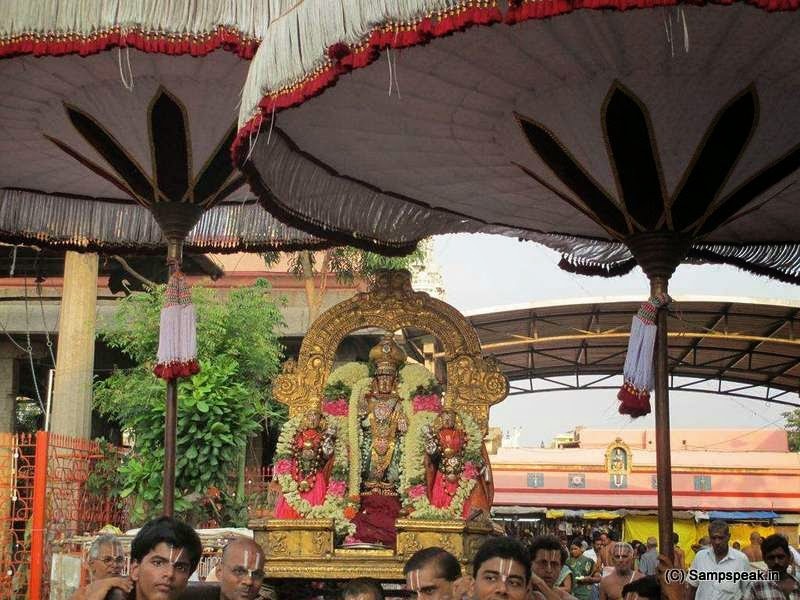 Sri Varadhar Uthsavam 2015 begins today !! 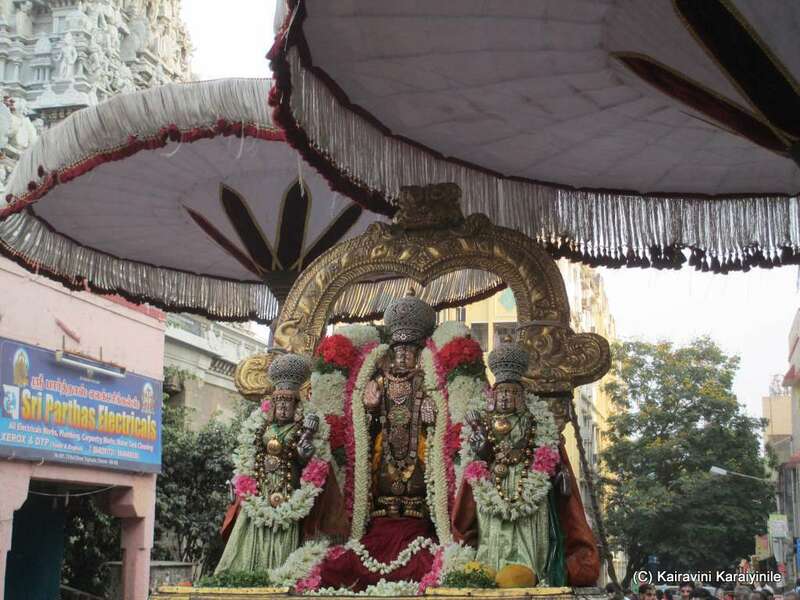 At Thiruvallikkeni divyadesam - s Sri Parthasarathi Swami temple is getting spruced for the Samprokshanam, the date of which is yet to be made official. 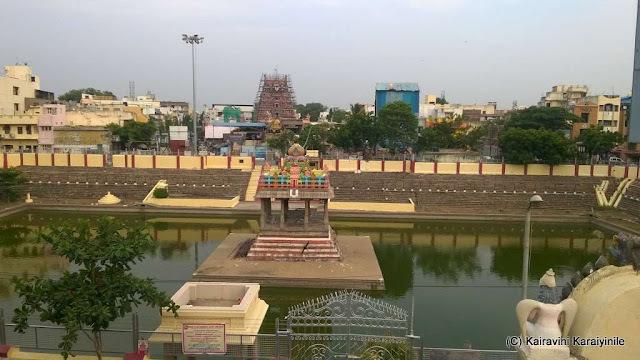 Today 30th May 2015 [16th day of Vaikasi ~ Chithirai nakshathiram] is significant ~ and here is an aerial photo of the Temple. The city of Kanchipuram, now famous for silks, was the seat of learning in the ancient languages of Pali, Sanskrit and Tamil. It has been a great spiritual town as it houses so many Temples. It is also the place where alongside Saiva and Vaishnava temples, Jainese and Buddhist viharas too prospered. It was the seat of the famous Pallava kingdom. 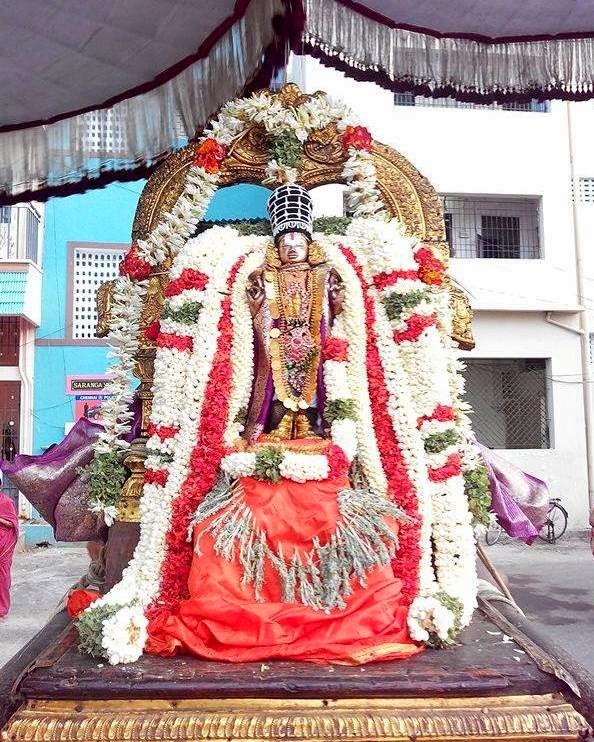 Today starts the Brahmothsavam of Lord DevapPerumal ~ Devathi Rajar, also known as Varadharajar at Thirukachi. 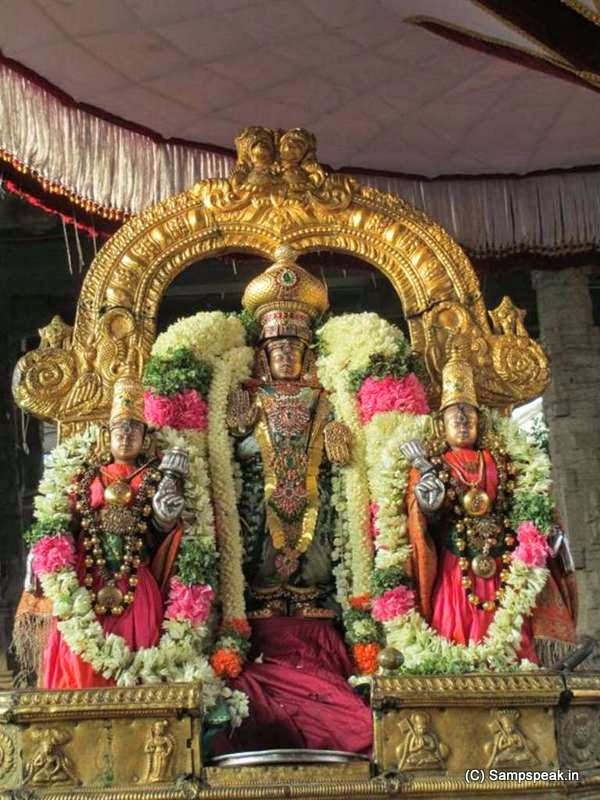 For Sri Vaishnavaites, it is ‘Perumal Kovil’ and it is located in vast expanse of 22acres in Chinna (small) Kanchipuram on the Kanchipuram - Chengalpet -Madras road. 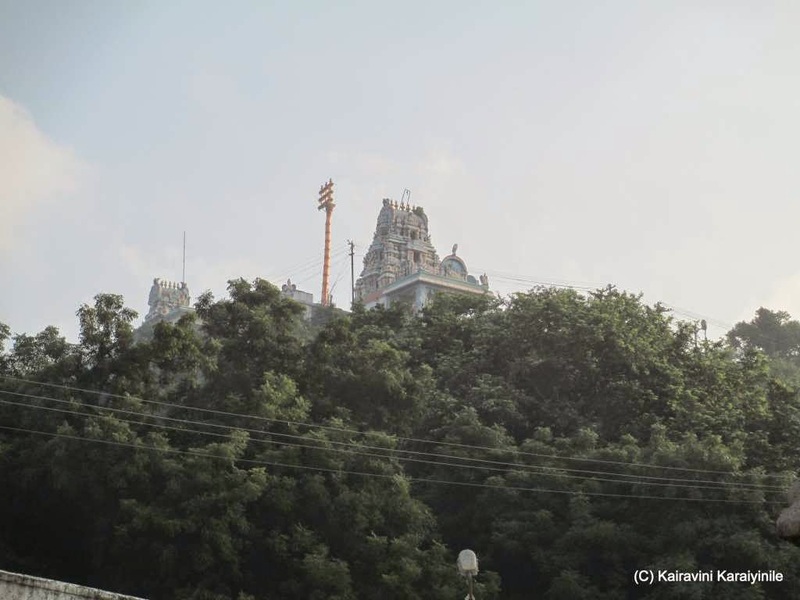 There are two big Gopurams - the Eastern Gopuram built by Krishnadeva Raaya and the Western temple tower built earlier by the Pallavas. Later, several rulers contributed to the renovation of this temple. Several beautiful sculptures can be seen at this temple. 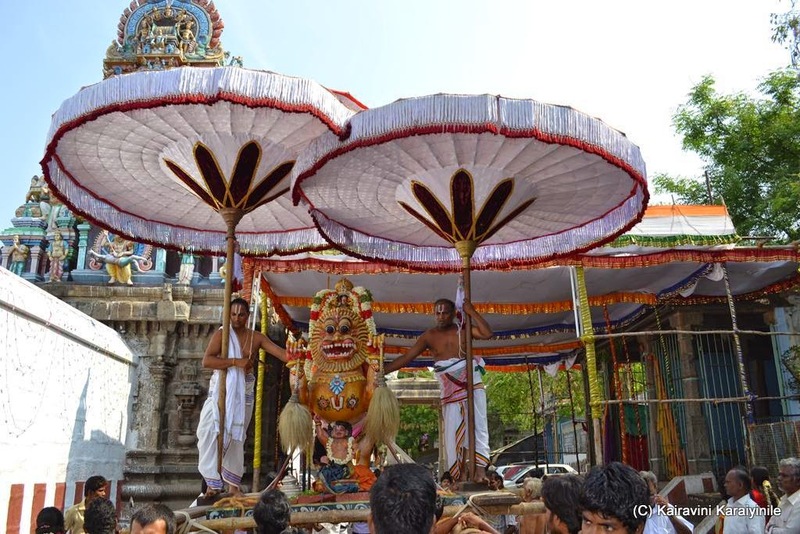 This Uthsavam assumes great significance as this was started by Brahma himself, celebrating the festival [Brahmothsavam] for Lord Devathi Rajar. 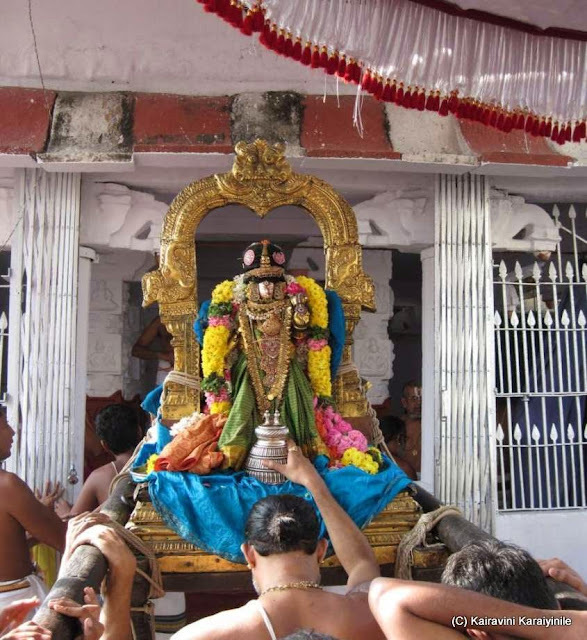 The Moolavar at this Thirukovil is on a small hillock 10m tall and a fleet of 24 stps, termed "Hasthagiri" – giving darshan in a standing posture. There are murals of the late Vijayanagara empire found on the ceiling. 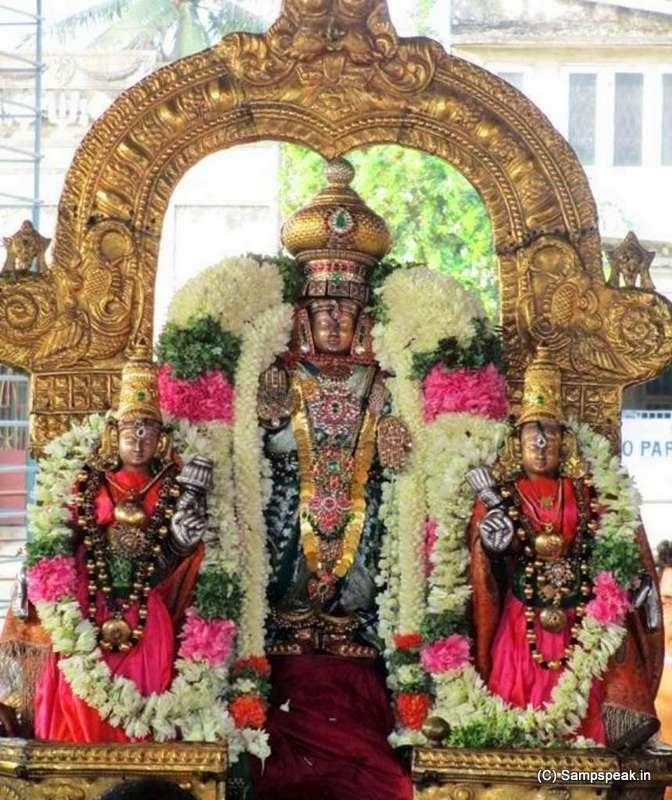 The thayar’s name is Perundevi thayar. 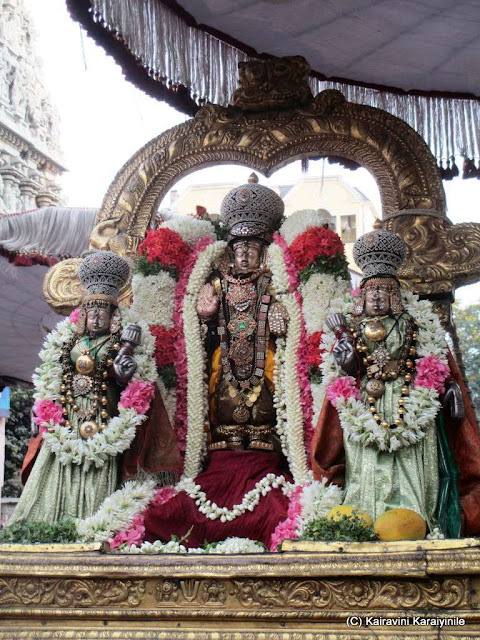 Today, the annual brahmothsavam of Lord Varadha Rajar started at Thiruvallikkeni too. Here the purppadus are on evenings only, save Garuda sevai on Monday 1st June 2015. 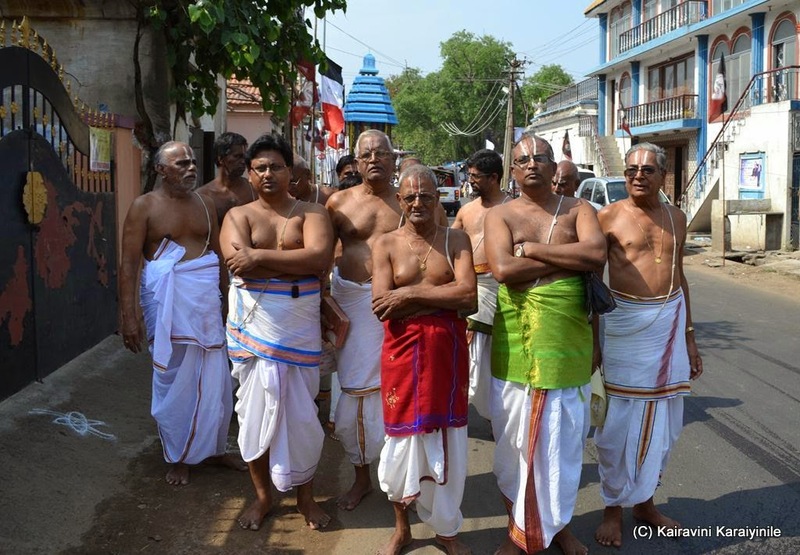 Here are some photos taken during today’s purappadu at Thiruvallikkeni. 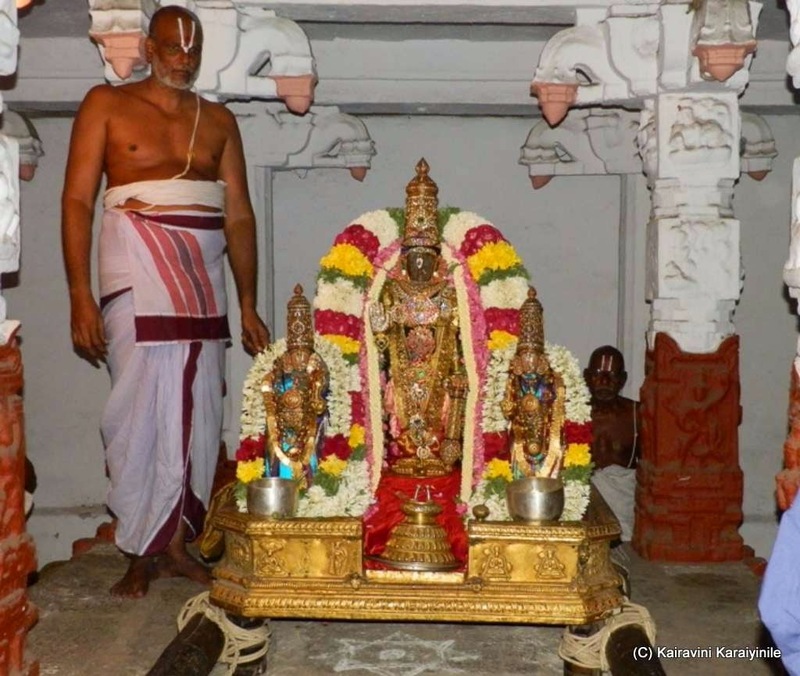 The last two photos are of Sri Deva Perumal of Thirukachi , courtesy my friend Sri VN Kesava Bashyam. 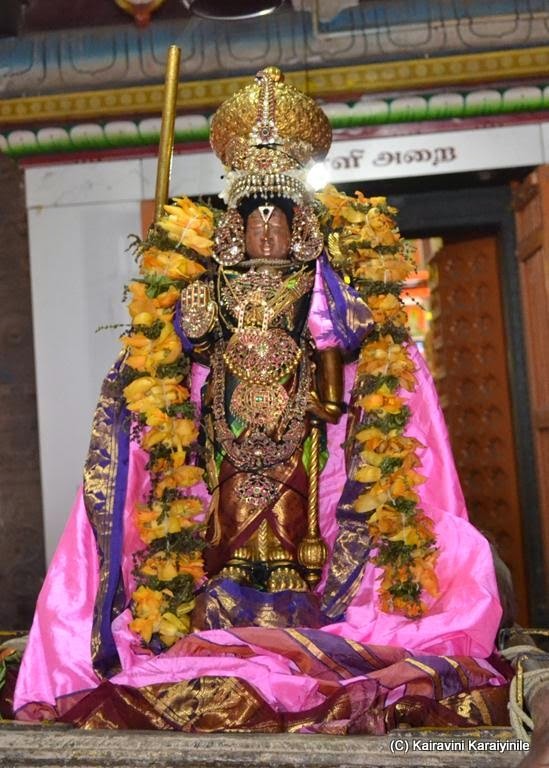 "Aaduthurai" divyadesam - Thiru Kudalur ~ கூடலூரே! 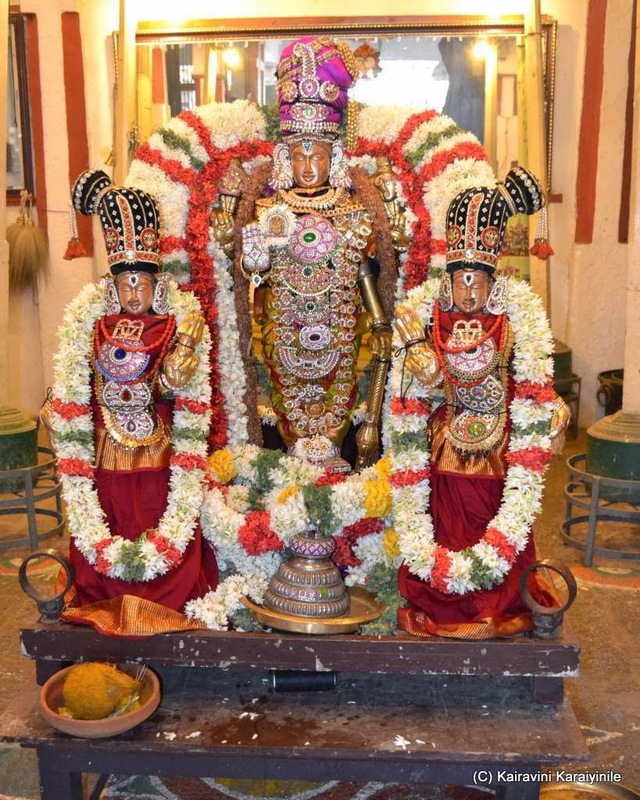 From Thiruvaiyaru of musical fame, one can easily reach Thirukandiyur ~and as we travel another 15 km east on the Kumbakonam Highway is the divyadesam locally known as ‘Aaduthurai’ housing the divine temple of Sri Jagath Rakshaga Perumal – here it is Lord Vaiyam [Ulagam / Universe] Katha Perumal in imposing standing posture. 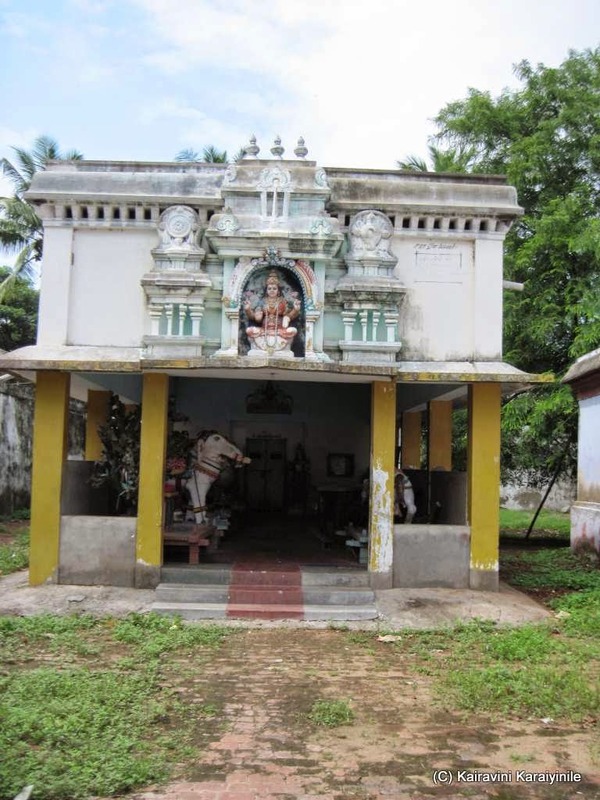 Papanasam is a village on the north bank of holy Kaveri river – not to be confused with the Papanasam in Thirunelveli / Ambasamudram - this is locally known as Vadakurangaduthurai - the temple is around 4 km from the town well known as – ‘Aaduthurai Perumal Kovil’. 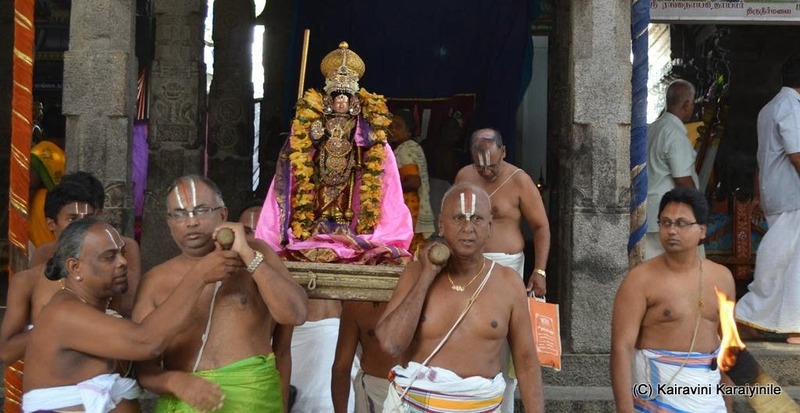 It is divyadesam having 10 pasurams of Thirumangai Mannan. 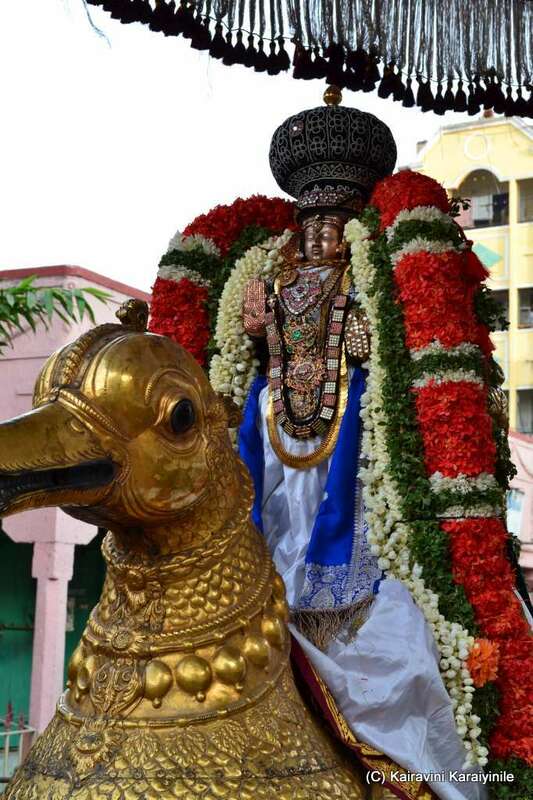 The Moolavar is ‘Vaiyam Katha Perumal’ and the beautiful Uthsvar is Jagath Rakshagar. Thayar is Padmasanavalli thayar. Thala vruthcham is Pala maram [Jack fruit]. 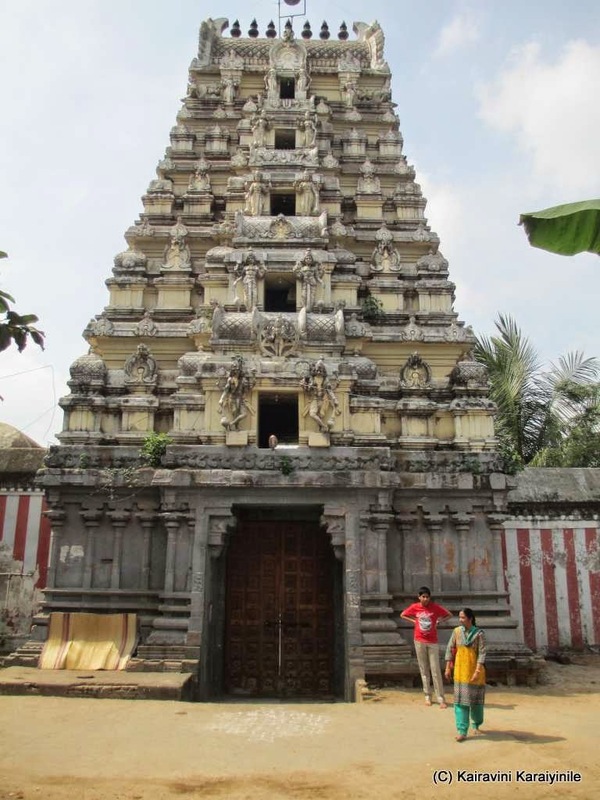 The Aduthurai Perumal kovil is believed to have been built by the Medieval Cholas with later contributions from Vijayanagar kings and Madurai Nayaks. A brick wall surrounds the temple, enclosing all its shrines and bodies of water. According to legend, Perumal here appeared to sage Nandaka and King Ambarisha. 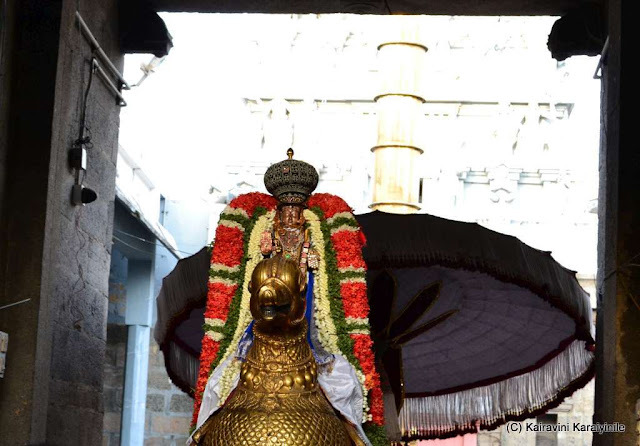 The holy river Cauvery purifies herself here by the grace of this Perumal. According to web reports, a thiruther called Ambarisha Ratha, renovated by Rani Mangammal, was in use till the 1940s, after which it was not used. கள்ளநாரை வயலுள், கயல்மீன் கொள்ளை கொள்ளும் கூடலூரே! The annual brahmothsavam of the temple is presently on. 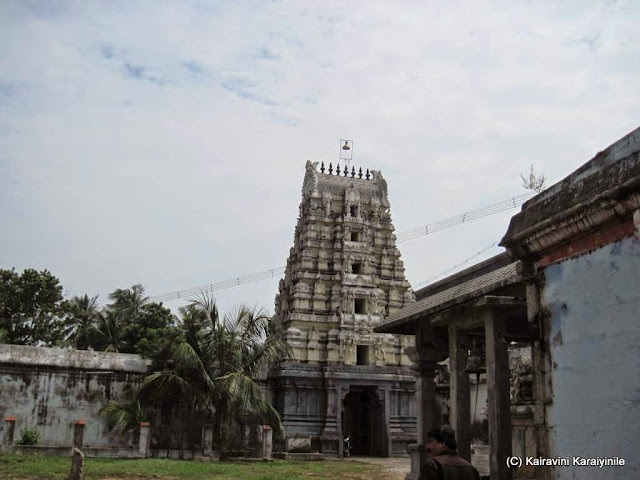 Here are some photos of the Temple ~that of the Uthsavar is courtesy my friend Sri Kidambi Mukundachar. I have been posting about the grand Brahmothsavam of Sri Devathirajar at Thirukachi and at Thiruvallikkeni. 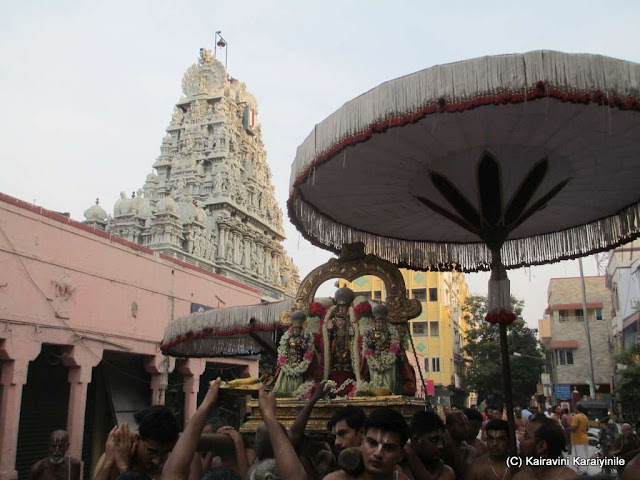 20th May 2014 was day 9 of the Uthsavam – it was Vaikasi Thiruvonam – the theerthavari day. It is a place that predates British rule by several centuries; it was occupied by the Portuguese in 1523, which lasted until 1749, later falling into the hands of the British East India Company. It is “Mylapore” [Thiru Mayilai], a cultural hub; one of the oldest residential parts of the city, also known as VEdapuri and Mayurapuri. 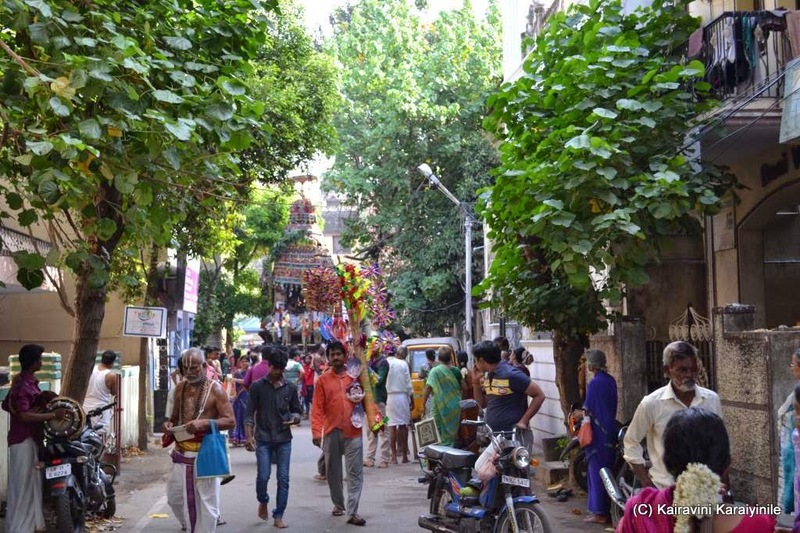 One would be surprised to find so many temples in small lanes and bylanes of Thirumayilapuri. As one crosses, the Hamilton Bridge, is the famous ‘Sri Mylai Madhava Perumal Thirukovil’ and behind this is ‘ Mundagakanni Amman temple’. 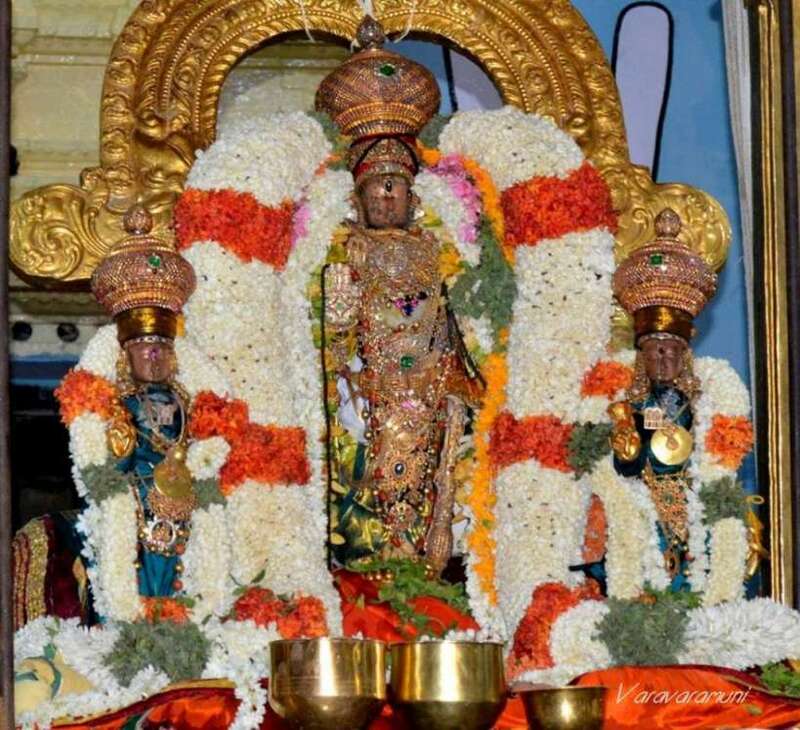 At Madhava Perumal temple, the Presiding deity is in a sitting posture hailed as Sri Madhavar and His consort is Amirthavalli. The Uthsavar idol is extremely beautiful. The annual brahmothsavam at Mylai Madhava Perumal Temple is on and today [17.5.2015] being the 7th day was “Thiruther”…… one could imagine smaller cars struggling in the bylanes here….the Thiruther grandly wound its way in the streets. Here are some photos taken this morning at Thirumayilai. 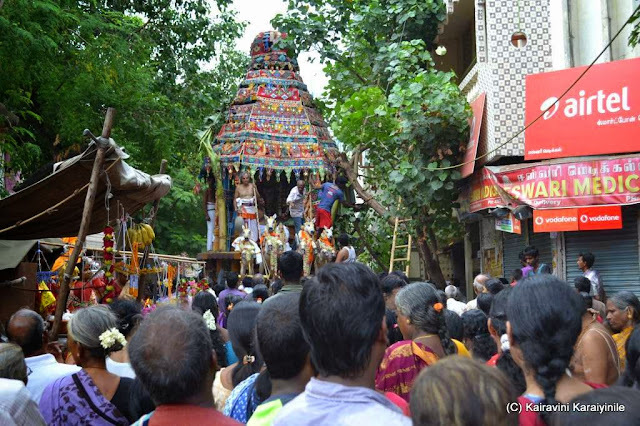 At Thiruvallikkeni, like in many other divyadesams – there will be festivities throughout the year. 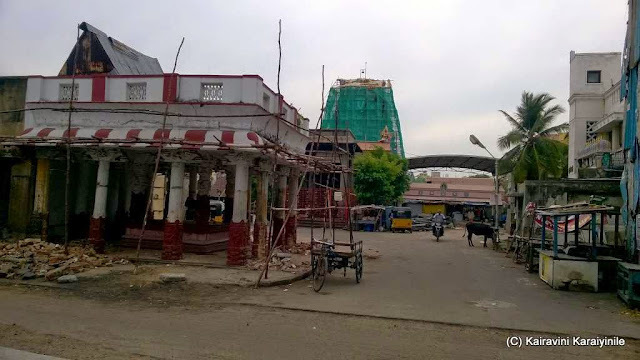 Devotees are missing the Brahmothsavam, Udayavar Uthsavams and monthly purappadus due to the ongoing renovation works since balalayam on Jan 26, 2015. 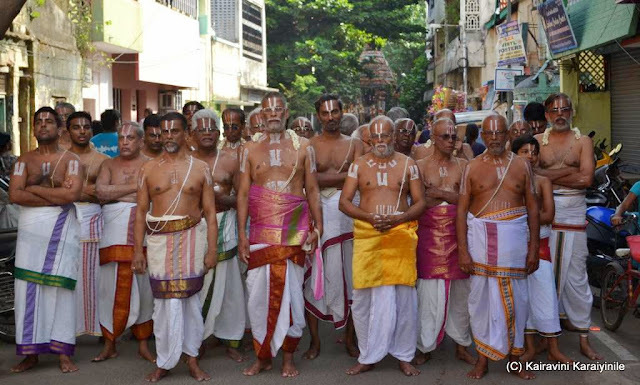 In the month of Margazhi, there occurs the Nine day festival for Andal known as Neeratta Uthsavam. Daily morning there will be veedhi purappadu of Andal signifying her preparation for the neerattam. After the purappadu, Andal will have ‘Thirumanjanam’ at the Neeratta mandapam which is just opposite to the Thiruther. 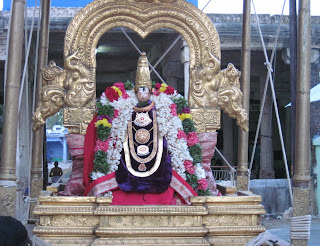 Sri Parthasarathi Perumal too visits this mantap immediately after the ‘theppam’[float] festival day 1. 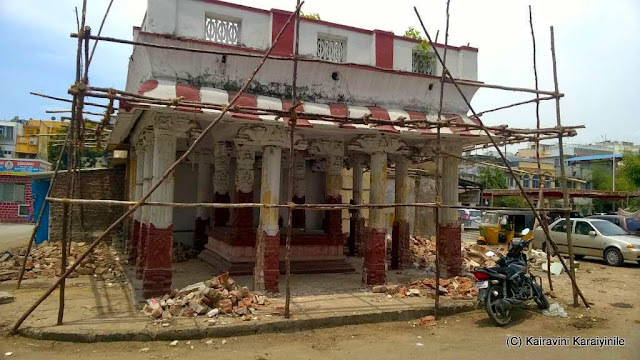 The shops and structures adjoining this mandapam have been removed now as it sports a much different look to those who have been visiting the temple for years. 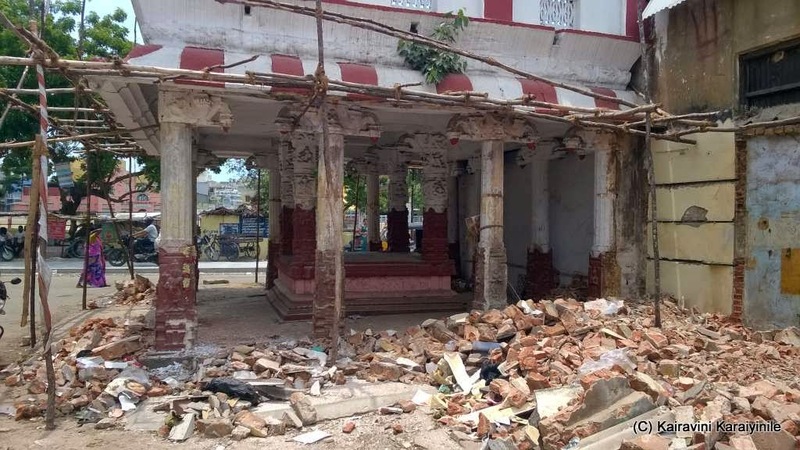 It is reported that atleast six layers of old slate lime have been removed from the mandapam whose pillars and walls have a lot of ornamental works. Here are couple of photos of the mandapam showing the old and new looks. Cambodia, once known as the Khmer Empire, is a country located in the southern portion of the Indo-china Peninsula in Southeast Asia. The kingdom is a constitutional monarchy. Cambodia's ancient name is "Kambuja" (Sanskrit: कंबुज). The Kingdom is known for monumental temples including Angkor Wat, now a World Heritage Site. The son of Vayu [Pavana puthra] – Hanumar is the epitome of great virtues ~ a great character – a warrior, mightily powerful, whose body was as hard as a diamond, whose speed equalled those of fastest flying eagles, who possessed great wisdom, who could organize a group of roaming ones, who can jump hundreds of miles, yet who remained at the feet of his Master, totally committed thinking of their welfare alone – unassuming, yet capable of telling the right things at the right moment – that is Pavana Puthra Hanuman – Aanjaneya, who is called ‘thiruvadi’ – bearer of Lord Rama – who carried Rama on his shoulders during the war in which the demon was killed. The very thought of Sri Hanuman brings to mind ~ his unparalleled devotion for Lord Ram and unrivalled physical strength. Lord Hanuman is everywhere – on mountains, big temples, street corners and more ~ Sri Anjaneya jumped over the Sea, met Sitadevi delivering her the signet ring ‘kanaiyazhi’ of Lord Sri Rama - Hanuman has crossed the seas with eases – but this travel is different !!! Cleveland, is a city in the state of Ohio. It was founded in 1796 near the mouth of the Cuyahoga River, and became a manufacturing centre owing to its location on the lake shore. The Cleveland Museum of Art was founded in 1913 “for the benefit of all the people forever.” Its website claims tobe a distinguished comprehensive art museum and cultural institution. We are reading about this, for it recently announced that it has voluntarily returned to Cambodia a much-beloved 10th century statue of Hanuman, after uncovering evidence that it was probably looted during the country's bloody civil war. The Cleveland Museum of Art said recently that it is in discussions with the Government of Cambodia concerning a 10th-century statue in its collection of the kneeling Hanuman, that reportedly had been looted from the country. 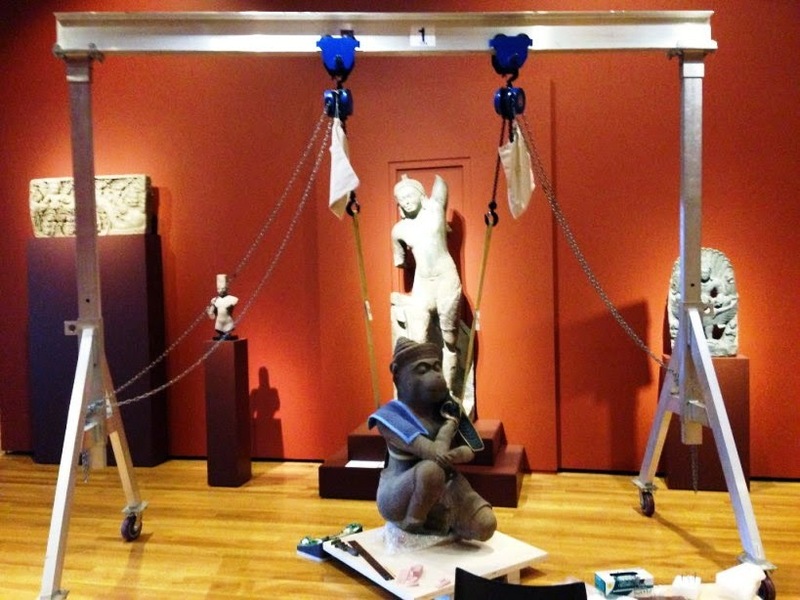 The museum's statement said: "Late last year, the Cleveland Museum of Art initiated discussions with the Kingdom of Cambodia concerning various topics of mutual interest, including the sculpture of Hanuman. These discussions have been very cordial and productive. According to the Cleveland Museum of Art’s website, the 10th-century sandstone sculpture stands about 116 cm tall and 54 cm wide and depicts the God in a crouching position. According to the head of the U.N. cultural agency Unesco in Cambodia, it was clear the statue had originally been attached to a base, but it wasn’t until archeologists unearthed previously undiscovered pedestals in the Koh Ker complex’s Prasat Chen temple last year that the statue’s exact location was determined. The Cambodia Daily newspaper has published photos showing what it described as the arrival and partial uncrating of the Hanuman at Phnom Penh International Airport. According to Newyork Times, the statue of a kneeling Hindu deity believed stolen from a jungle-shrouded Khmer temple more than 40 years ago, has been returned to Cambodia by the Cleveland Museum of Art, which had displayed it since 1982. The return, on Sunday night, brings to six the number of looted statues from the 10th-century Prasat Chen temple in Preah Vihear Province, in northern Cambodia near the Thai border, that have been recovered by the government since 2012, when reports surfaced that the rare sandstone sculptures were in the United States. Those items include two large Kneeling Attendants returned by the Metropolitan Museum of Art in 2013; a massive statue known as Duryodhana returned by Sotheby’s last year after the intervention of federal officials; a companion statue of the Duryodhana, known as Bhima, returned by the Norton Simon Museum in Pasadena, Calif., last year; and a smaller statue from the temple, Pandava, relinquished by Christie’s in May 2014. Buddhist monks chanted blessings and scattered flowers over the statue upon its arrival at Phnom Penh International Airport, according to an AFP photographer. “We welcome back the statue of Hanuman from the Cleveland Museum of Art in the US,” Chan Tani, Cambodian Secretary of State for the Cabinet Office, told reporters. The statues are considered pieces of extraordinary value to the Cambodian people and part of their cultural heritage. 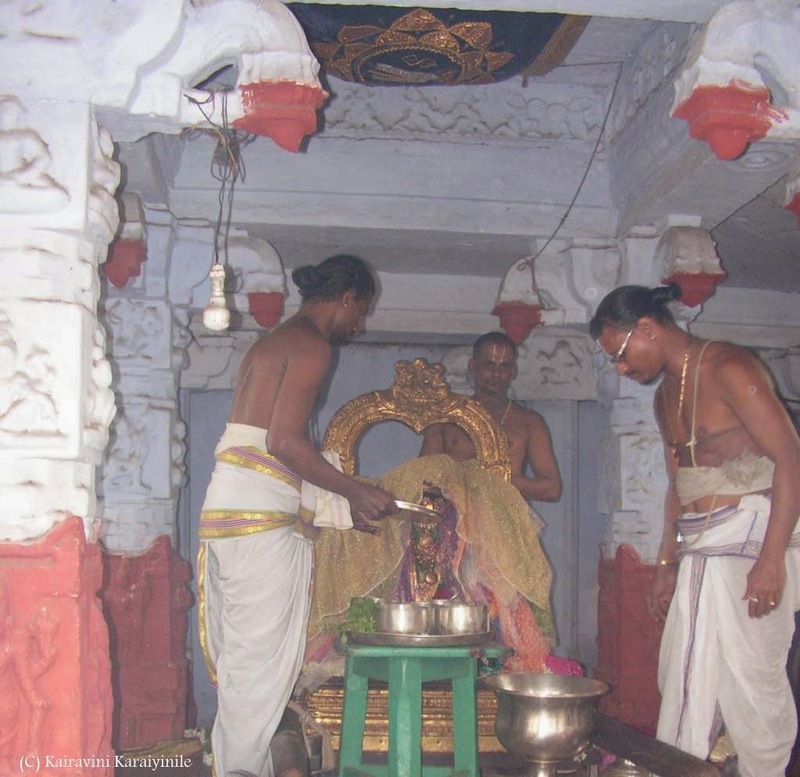 For a Srivaishnavaite, service (kainkaryam) to Sriman Narayana and His devotees is the purpose of life. We take immense pleasure in visiting Divyadesams and worshipping Sriman Narayana in pristine glory in such places. In the Thondaimandalam (very much inside the city of Chennai) lies the divyadesam – Thiruneermalai. 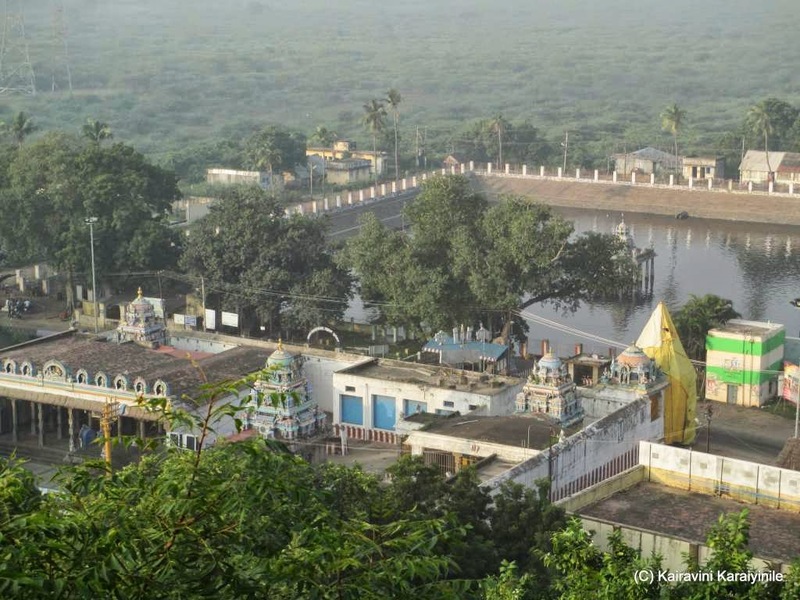 Thiruneermalai has a beautiful pushkarini and is in two parts – one at the ground level and the other atop a small hill. 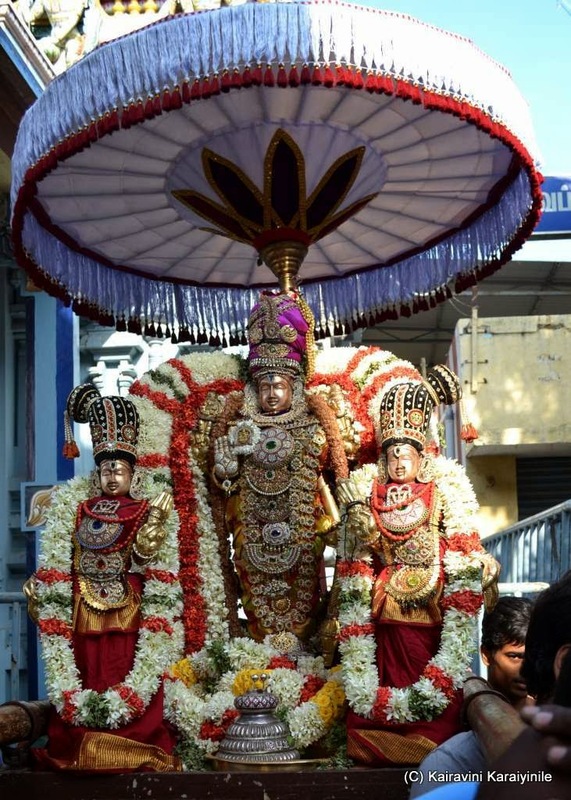 The sannathi of Neervannar is at the base along with his consort Animamalar Thayar and sannathies of Kalyana Ramar and Andal. 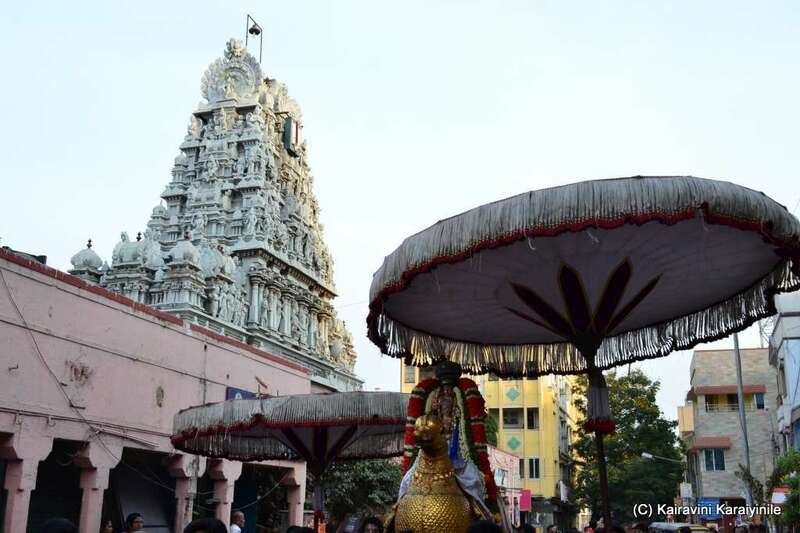 As one ascends 300 odd steps, one can have great darshan of Lord Ranganathar (in reclining posture); Thiruvikramar; Lord Narasimha (in sitting posture) - “நின்றானிருந்தான் கிடந்தான் நடந்தாற்கிடம் மாமலையாவது நீர்மலையே” – in the words of Thirumangai Azhwar. 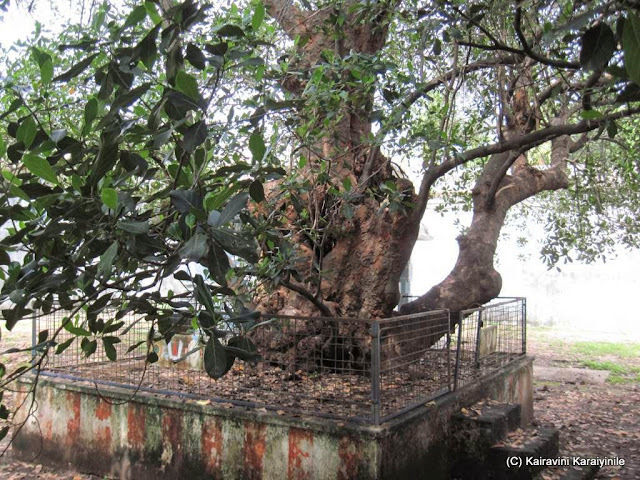 At the time of Azhwar mangalasasanam, this place was surrounded by water and hence ‘Thiruneermalai”. Today had the fortune of worshipping at this Divyadesam. 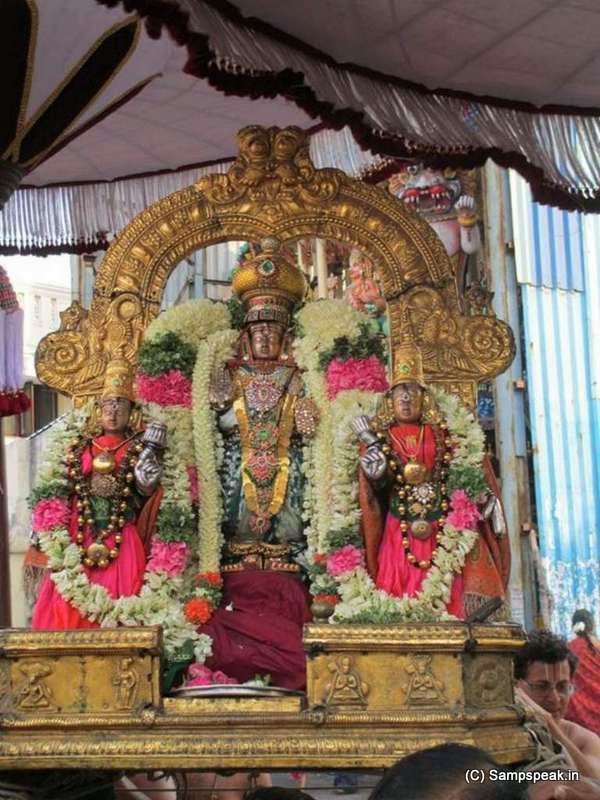 Today it was 2nd day of Sri Ranganathar Brahmothsavam and there was Simha vahana purappadu. Here are some photos taken by me. The sarruppadi deserves special mention ! Today, 2nd May 2015 is ‘Chithiraiyil Chithirai naal’ [Chitra Nakshathiram in the month of Chithirai] ~ the birthday of Sri Madhurakavi Azhwar. 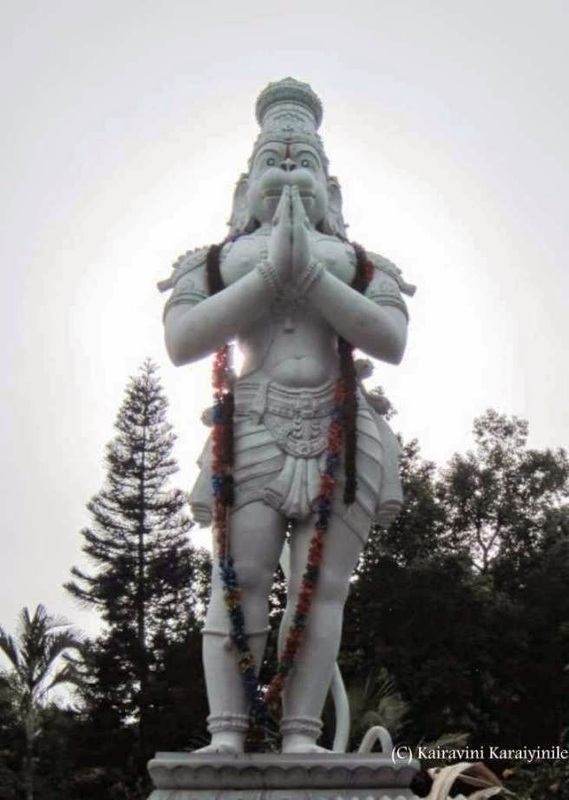 He was born in Thirukkolur as incarnation of Sri Garuda. He sang only one divyaprabandham ~ ‘Kanninun Chiruthambu’ consisting of only 11 hymns; his life was intertwined with that of Sri NammAzhwar. Of the Nava Thirupathi divyadesams, Thiruk Kurugoor is hailed as Azhwar Thirunagari, as it was here Swami Nammalwar was born. Madura Kavigal saw the leading light from Thiru Ayodhya and travelled all the way to Azhwar Thirunagari and identified Nammazhwar in the Puliyamaram. Mathurakavigal was so attached to Nammazhwaar that he sang only in praise of Nammazhwaar and considered his duty to spend life devoted to Nammazhwaar. He as a disciple was attracted to the holy feet of ‘Kurugaip Piran’ [Swami Nammazhwar] and claimed that he knew none and nothing else than his Acharyar……. ~an exceptional piece of guru bakthi. Generally, His Sarrumurai would come during the brahmothsavam. 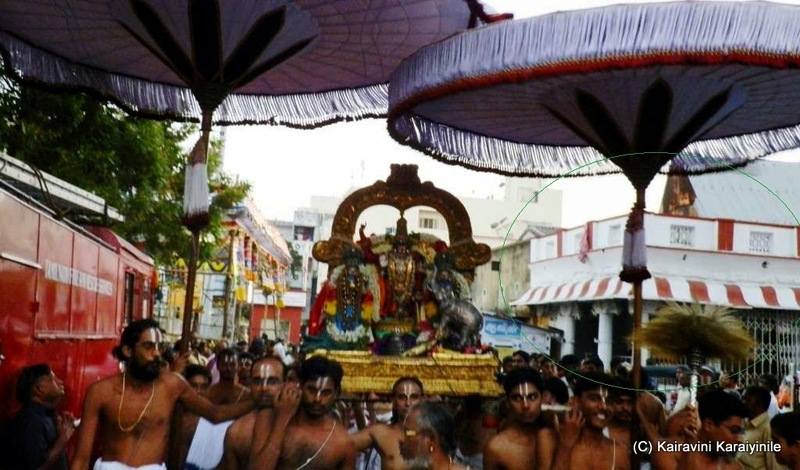 However there is no purappadu today at Thiruvallikkeni due to balalayam. Here below is photo of Sri Madurakavigal taken earlier at Thiruvallikkeni and one taken at Thiru Kurugoor. திருவாய்மொழி தனியனில் : - “ திருவழுதி நாடென்றும் தென்குருகூரென்றும், மருவினிய வண்பொருநல் என்றும்,” - என பாண்டிய நாட்டு நாடு தாமிரபரணி நதியின் பெருமையும் குருகூர் திவ்யதேசத்தின் பெருமையும் விளக்கப்படுகிறது. இத்தலம் நம்மாழ்வார் அவதரித்த தலமாகும். 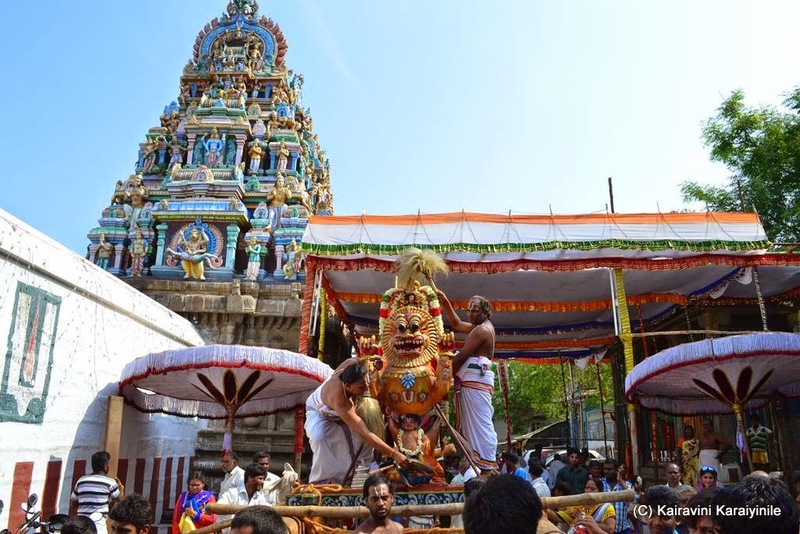 இதனால் இத்தலம் ஆழ்வார் திருநகரி என்றழைக்கப்பட்டது. ஸ்ரீ மதுரகவி ஆழ்வார் ஈஸ்வர வருடம், சித்திரை மாதம், சுக்ல பக்ஷ சதுர்த்தசி திதியில் சித்திரை நக்ஷத்ரம் அன்று திருக்கோளூர் என்னும் திவ்யதேசத்தில் வைநதேயத்தின் அம்சமாக திருவவதாரம் செய்தருளினார். 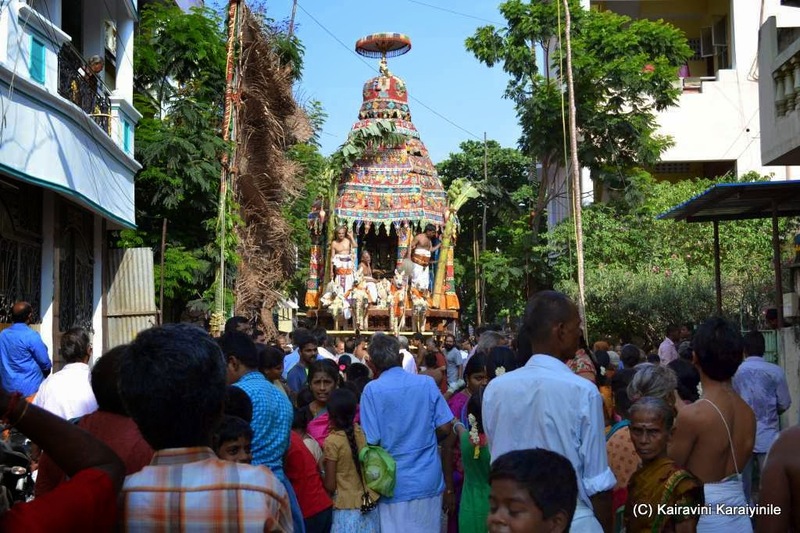 ஆழ்வார் ஞான பக்தி வைராக்யங்கள் நிரம்பப் பெற்றவர். மதுரகவியாழ்வார்ஒரு சமயம் அயோத்தியில் இருந்து தென் திசை நோக்கி வணங்கும் போது அத்திசையில் ஒரு பேரொளியை கண்டார். அதிசயத்த மதுரகவியாழ்வார் அந்த ஒளியை நோக்கி நடந்து வரத்தொடங்கினார் அந்த ஒளி ஆழ்வார் திருநகரி புளியமரத்தடிக்கு வந்ததும் மறைந்து விட்டது. நவதிருப்பதிகளில் ஒன்றான ஆழ்வார் திருநகரி ஆதிநாதர் ஆழ்வார் கோயிலில் உள்ள "உறங்கா' புளிய மரம் பூக்கும், காய்க்கும் ஆனால் பழுக்காது. 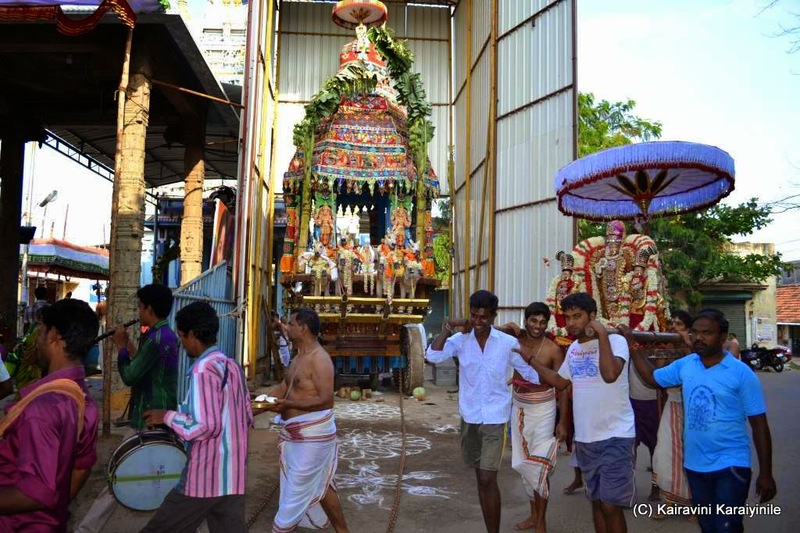 இன்றும் கோவில் உள்ளே இந்த மரத்தை சேவிக்கலாம். அந்த மரத்தில் ஒரு மகா ஞானி இருப்பதை உணர்ந்த மதுரகவியாழ்வார், ஞான முத்திரையுடன் மோனநிலையில் இருந்த சடகோபரை எழுப்ப நினைத்து, அவர் அருகில் ஒரு கல்லை போட சடகோபர் கண்விழித்தார். "செத்ததின் வயிற்றில் சிறியது பிறந்தால் எத்தை தின்று எங்கே கிடக்கும்" என சடகோபரிடம் மதுரகவி ஆழ்வார் கேட்டார்? அது வரை பேசாமலிருந்த சடகோபர் "அத்தைத் தின்று அங்கே கிடக்கும்"என்றார். மதுரகவியின் கேள்விக்கான நேரடியான விளக்கம். அவர் கேட்டது, உயிர் தோன்றும்போது அந்த உயிரானது எதை அடைந்து, அனுபவித்து எங்கே கிடக்கும் என்பது... அதற்கு நம்மாழ்வாரின் பதில் - அந்த உடம்பின் தொடர்பாக வரக்கூடிய பண்புகளைத்தான் கொள்ள முடியும் என்பது. இந்நிகழ்ச்சியிலிருந்து சடகோபரை நம்மாழ்வார் என்ற பெயரில் மதுரகவி ஆழ்வார் அழைத்தார். இவர் அருளிச் செய்த திவ்ய பிரபந்தம் கண்ணிநுண்சிறுத்தாம்பு ஆகும். மதுரகவிகள் தம் ஆசார்யனான ஸ்ரீ நம்மாழ்வாரையே தமக்கு எல்லாமாகக் கொண்டாடுகிறார்.